not as good but works in a pinch! I’ve made this many times, I usually add soyrizo to the veggie mix in the frypan and an extra can of black beans. I freeze it in meal-sized portions to bank future meals for busy nights. I’ve had guests watch me put it together and still think there’s meat in it. This is a great recipe. Any suggestions as to what to use instead of Zucchini and/or Squash? I love most all vegetables but those are 2 that I don’t even like!! This recipe is a regular of mine now. Thanks for sharing it! Hi! What are the -reheating directions if you just want it for dinner the next night from the fridge? You can reheat in the oven. Made for dinner tonight, it was delicious! Added some chopped cherry tomatoes I needed to use before they go bad and they were a good addition. Might have eyeballed the amount of chopped jalapeños and it came out spicy! Great recipe. Another amazing recipe! Thanks to your website I’m sneaking veggies into dinners like never before! I’m pretty sure my husband had no idea this was a vegetarian dish. This was really yummy! However, it was spicier than I expected given that I didn’t see any comments about spice. I think some sour cream on the side would be great. I just made this tonight and am IN HEAVEN!!! I used the enchilada sauce from your cookbook since I had the ingredients for it on hand. This is definitely going to be one of my regular go-to recipes!!! Made this last night. Very yummy. Husband ate his with a few chips. Tortillas basically turned to mush though. Is there a way to avoid that? We are trying to eat more and more vegetarian. 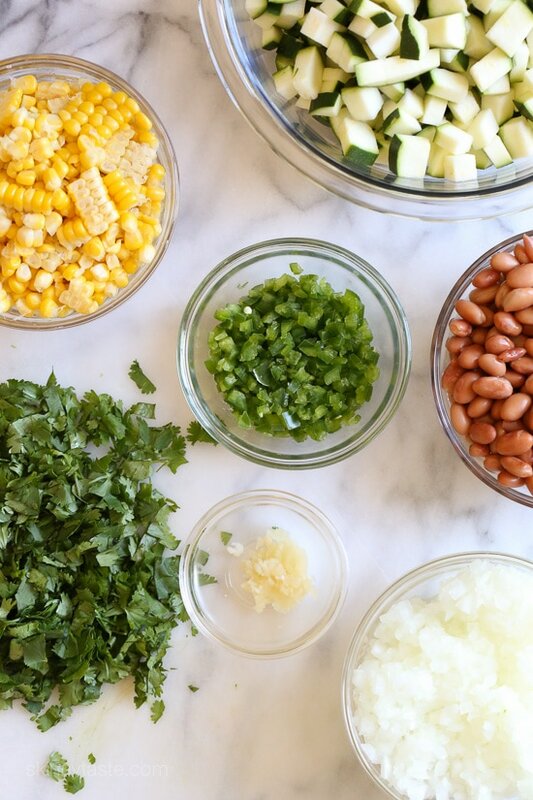 This recipe for the simple ingredients packs a lot of flavor and interest. The corn right now is so good and I had a yellow squash and used that . My husband kept going back for more. I had to make one for myself with less heat, but my husband loved the recipe as is. I froze a 1/2 pan size for later and it will be nice to be able to pull it out for my vegetarian sister when she visits. I made this last night and we loved it! 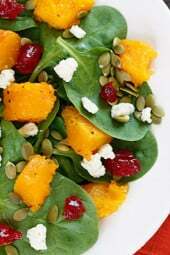 The fresh veggies really give it some great flavor and freshness. I used canned enchilada sauce to save time and it was still great! We didn’t even miss the meat! Hopped onto your site yesterday looking for a dish to take to a party and this was the first thing I saw, so I figured it was the one. It turned out great and got rave reviews, no leftovers for me! I used your skinnytaste enchilada sauce, added a can of green chilis and some ancho chili powder and a little salt to the veggies. The fresh corn though an extra step kind of made the dish. I’ve made this and it’s delicious! Planning to make again but have a question. If I am freezing this, should I bake first and then freeze or freeze unbaked? Thanks so much! I would bake and freeze. I made this tonight using Gina’s enchilada sauce recipe. It was fantastic. Plus, without meat, you get more cheese! We roped with lite sour cream, cilantro, and green onions. This will definitely be in our regular rotation and is good enough to serve for company. Can I use ancho chili powder instead of dried chilis? If so, how much? I make this once a week!! Can’t get enough. saturated fat not listed-so is it zero? can’t wait to try this-made it last night-will have it for supper tonight! Love all the skinnytaste recipes i have tried so far and have the slow cooker cookbook-i do my weekly meal prep from these recipes-thanks for so many options! Hi Gina, just made this for the first time and it was really yummy! Although the tortillas sort of just turned to mush. Is that norm? Still love the taste. ???? 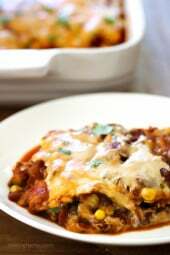 Made this tonight with your enchilada sauce, great success and will rotate for meatless meals! Are all 5 cups of sauce used in the recipe? Would like to take a shortcut and buy canned enchilada sauce but not sure how much I will need. Thanks! I made this last night and it was delicious! I added a lb of ground chicken to the filling because my husband will only eat it if it has meat. haha Only added one more sp per serving! First off, thank you for sharing this recipe out of your book. I love that you don’t make everyone buy the book to get your recipes. I will be purchasing your book in the near future because your recipes are truly epic and I would like to support you. Secondly, how much enchilada sauce is required for the recipe? I want to buy my own. Is it the 5 cups mentioned in the beginning? 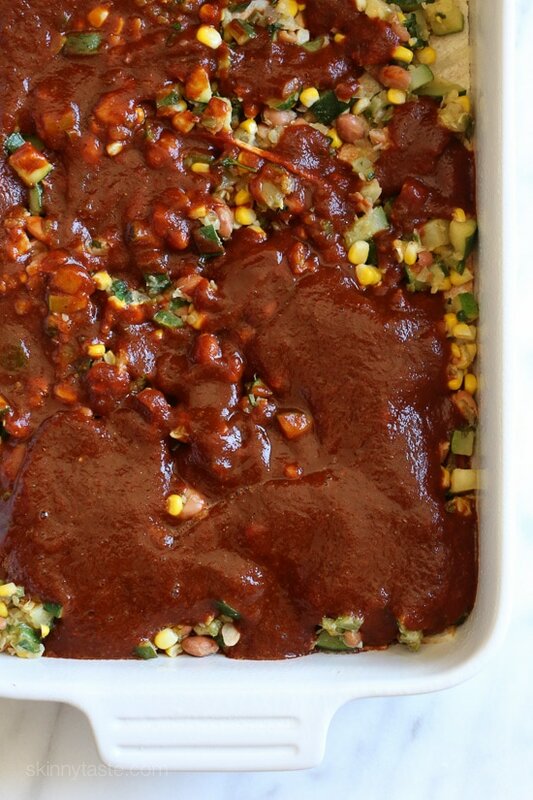 I made this with your homemade enchilada sauce & I have one word to describe it…AMAZING! 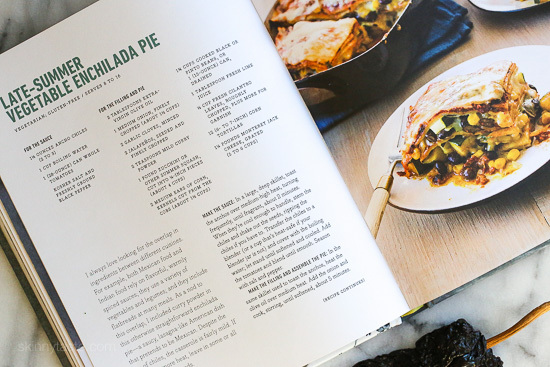 I have loved every one of your recipes, but this one might be #1 on my list of favorites! Thanks for providing recipes I can feel good about feeding my family while I try to lose a few pounds! Can’t wait to make it again! Has anyone prepped this ahead of time and baked next day? How did it turn out? I just made it and wondering if I should bake now and reheat tomorrow or cook tomorrow? Thx! Delicious! I used Yellow squash as I had a plethora of it. Since I’m supposed to avoid tomato sauce, I made a green chile sauce and added arias red red pepper. This was so good.! Thanks Gina! This was a delicious dish and just as described “end of summer”. I used canned enchilada sauce only due to time. I will definitely try the sauce with ancho peppers next time and may add the extra step of grilling the corn. Thank you for a wonderful recipe worth repeating! Just made this and it came out great! I browned ground turkey meat and used enchilada sauce from a can because I was pinched on time. I highly recommend adding browned meat to this dish! Hi Gina, I would like to substitute ancho chili powder for the ancho chilis. Is that possible? Would I just purée the powder, tomatoes and water? Thanks! Well – that was a soggy dish!! Great flavor but everything was swimming in watery sauce. Tortillas were very soggy and reminded me or dough balls or something. 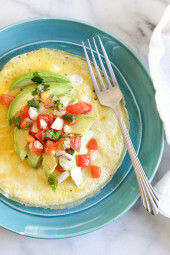 If I make this again – I would skip the tortillas – figure out how to make it less watery – and just put the filling into a tortilla. Like I said before – great flavor but that was about it. I can’t even begin to tell you how tasty this dish is. I added chicken because typically my meatless dinners turn away my husband and nine year old. However…..this dish is AMAZING!!! I will be leaving out the chicken next time! This recipe is SPOT ON! I’ve read this recipe back and forth trying to figure out where that 1 tbsp lime juice goes! I just ended up stirring it into the veggies/beans mix. No clue other wise. Ah, I see it was updated since I originally downloaded it. With the beans and veggies. 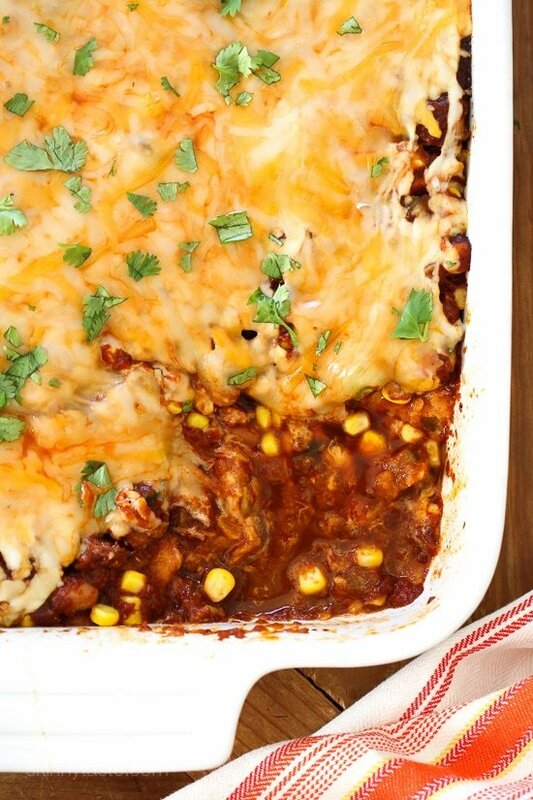 I made this last night and took the lazy way out – just so others know – used canned corn, canned enchilada sauce, canned chopped jalapeños and couldn’t for the life of me find low fat mexican blend cheeses so used the regular – just less. Everything else I followed exactly and from start to finish this took me maybe 10 minutes to chop and prepare. The results – amazing! My husband raved on and on and went for seconds. I froze the rest and I must say – next time when I have more time, I will make everything from scratch but in the meantime just know that even with my shortcuts – it came out amazing! A definite keeper! Made this for a group of friends who are usually not big on vegetarian dinners, and they positively raved about it! One very ardent meat-lover even said it is the best meatless meal he has had in his life. So tasty and full of flavor, I will definitely be making it again! Made it last night and had to use store-bought enchilada sauce because I couldn’t find the ancho chiles. Also I just added the cumin and lime to the filling and it turned out great. Thanks for such healthy and flavorful recipes. Really has been a game-changer in my house. This was delish but it was very watery. I’m assuming it’s from the zucchini. Is there a remedy for this? I thought about salting it and letting it drain in a colander first. Made this last night! SO good! Made this tonight and it was amazing. Added shredded chicken and store-bought enchilada sauce- turned out great! I’ve got this baking in the oven right now! I assumed you add the Cumin and lime juice to the filling as it is not stated in the instructions. Looking forward to eating it! Thanks for another great recipe. 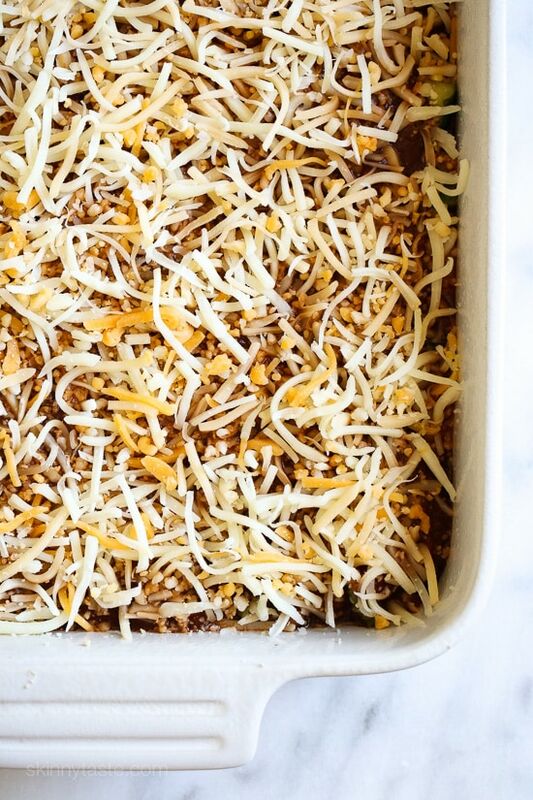 Do you think that the casserole could be premade and baked later? It looks delicious! Did you try this? Curious also since I just made it and debating! 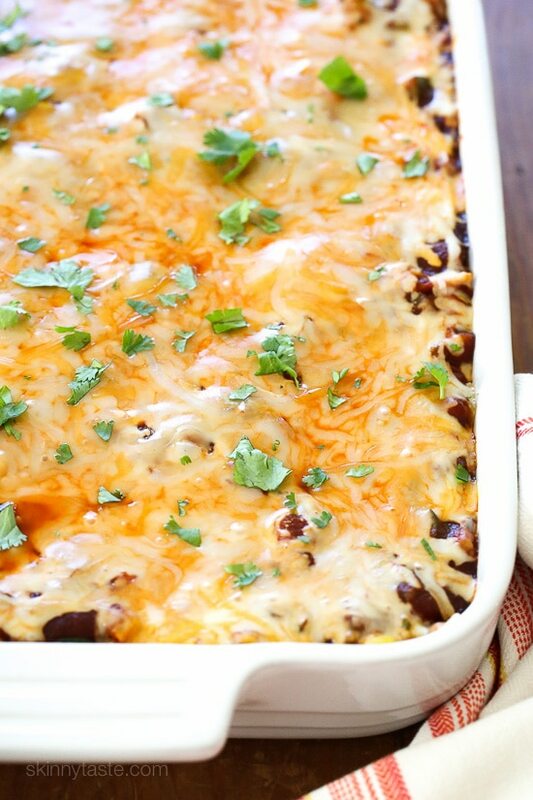 Looks absolutely delish… When do you add the cumin and lime? Thanks! This was SO good! One of my recent favorites, thanks for sharing! What can I substitute for the chilies?. We love Mexican food and this looks yummy but we can’t do the ‘hot’ chilies. We are mild Mex eaters. You can leave them out if you prefer. Gina, do you have a particular brand/version of corn tortillas that you like because of the points? 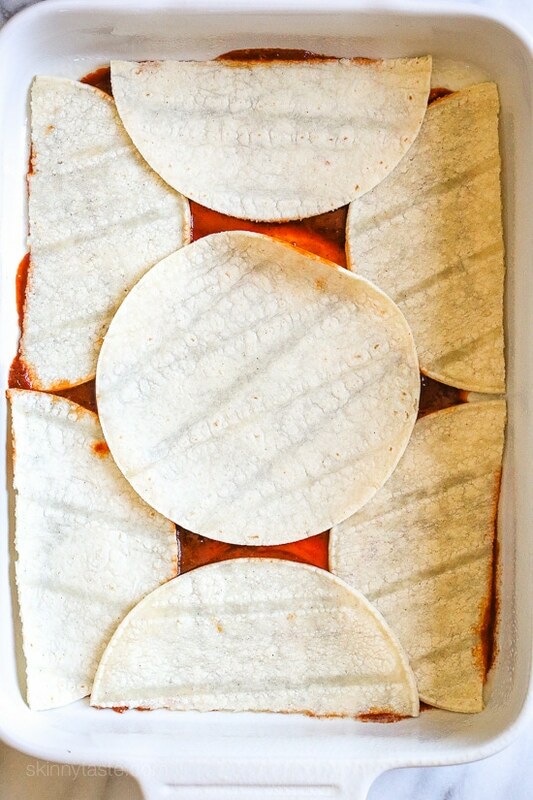 If you use extra thin tortillas they are less points. 3 extra thin tortillas are 3 points vs 3 regular corn tortilla are 5 points. Just put this together, looking back on the recipe, it didn’the say when/where to put in the lime juice or cumin..so mine does not have either at this point…hope it turns out okay! Was I supposed to use the liquid from the can of whole tomatoes in the enchilada sauce? I did, and my casserole turned out really soupy. I am expecting my 2nd child in November and this looks like a great recipe to make and freeze before the baby is born! I was also just diagnosed with gestational diabetes and I love that most of your recipes are low carb so great for me to eat! Thank you so much Gina for your great recipes and I can’t wait for your next cookbook in October! Made this tonight and used the enchilada sauce from the book and it was amazing! I wasn’t sure when to put in the lime juice and cumin per the recipe but it worked fine. I love love love your recipes! Some of my favs include your spinach lasagna rolls and Slow Cooker Honey Sesame Chicken… Yum! I just made this vegetable casserole and it was delicious 🙂 I did notice in the directions it did not say when to add the lime juice and cumin so I just added it when I added the corn and beans. Did I overlook this in the directions? Thank you Gina for all you do! When do you add the cumin and lime juice? Thanks! Planning to make it this week. With the corn, it’s updated now. Can’t wait to make this! Question – where do you typically find lowfat Mexican blend cheese? I cannot seem to find it at Kroger or Walmart, do you ever get it at whole foods or fresh market? Those are my only options left! My Kroger here in Houston sells the shredded Kroger brand reduced fat Mexican blend. If you can’t find it, maybe just use reduced fat cheddar? I found it at Aldi’s. Walmart’s Great Value brand has one blend labeled as “2% reduced fat, fiesta blend cheese”. Kraft also makes a blend called “2% milk, mexican style four cheese”. There’s also the Kroger version that someone else mentioned. Personally, I like the taste of the Sargento’s four cheese blend the best. Sargento also makes a reduced fat (2% milk) cheddar-jack shredded blend that would be a great substitute. Or you could make your own by mixing reduced fat cheddar with monterey jack . Shoprite just came out with their own reduced fat Mexican blend cheese (also shredded sharp cheddar). It sells for 1.99 usually. Look delish! Could you clarify how many ancho chilies to use? Is it 1.5, or 2-3? Thanks! It is probably 1.5 ounces of ancho chiles, which would equate to about 2-3 chiles. I have the modern pot luck cookbook as well. 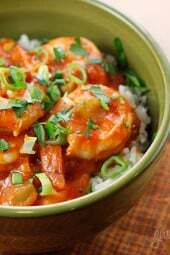 I noticed that you used cumin instead of curry powder, would you recommend the change in it? Does cumin/curry powder make much of a difference? I had all the ingredients at home to make it except the ancho chiles, just got them yesterday so it’ll be on my dinner plate very soon. With just the two of us I’m all about making a full recipe, dividing it into two square bakers, baking one now and freezing one for later (before it’s baked). Is this recipe suited to that? Thanks!